Olya Perevalova Cohen is a level 16 Zwifter and skilled artist. 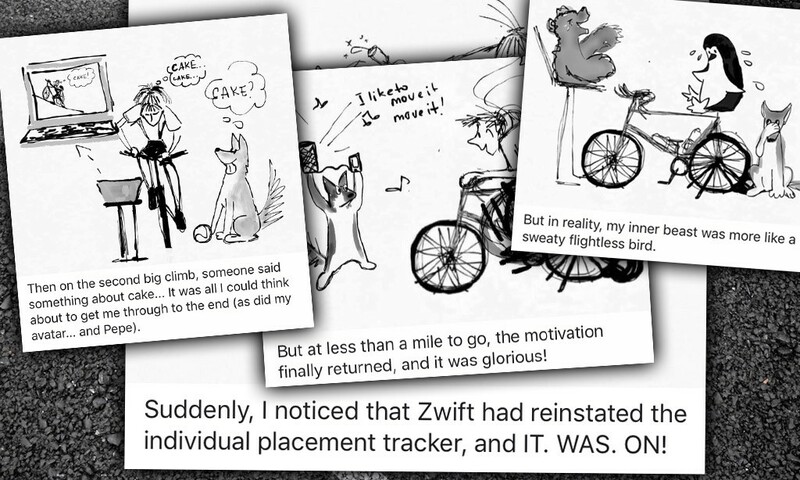 She illustrated each stage of her (and faithful dog Pepe’s) Tour de Zwift efforts, giving us a little window into her personal experience of the month-long tour. Here is each set of illustrations, beginning with Stage 1. Enjoy! I wonder if Olya was on the same ride as me when I mentioned “cake”. For clarity, I got the saying from Matt back when he was on GCN. 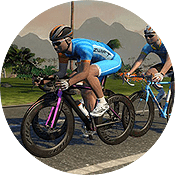 I’ve talked to Olya about publishing more Zwift-related illustrations if she does them, and it sounds like that’s going to happen. So stay tuned! I love this!!! I love Pepe! This is the best! This is great! 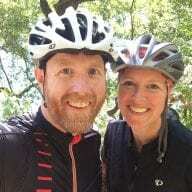 Thank You!, I just read it with my 7 years old who also Zwift with me and he loved it! Fun! Love these! Olya, thank you so much for sharing your art! Thank you all so much for such positive responses! I am especially excited about the kudos from the 7 year old (that can be a tough audience to reach, Pepe is excited about it, too). And yes, stroopwafels are the best! More cartoons to come as soon as I recover from the Tour :-). Pepe can’t wait to be featured again, she is becoming quite a diva. That was fun! And very relatable. I am now convinced that I need to find me a dog. I would love to see more of these! Greetings from the home country of stroopwafels. That is super fun! Love the illustrations! She seems like a totally fun and strong chick!